Kit out your home or office with a desktop or All-in-One PC. Apple desktops combine power and style. Play AAA titles on a gaming PC, and explore the latest VR technology. We’ve got monitors for professional, home and 4K setups. 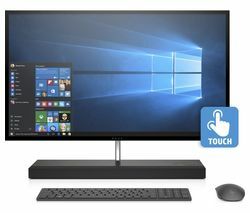 All-in-one PCs feature both the screen and base-unit in one convenient, space-saving device. They’re available in lots of different specifications, including large and touchscreen varieties that are perfect for home entertainment. Desktop PCs are available with a wide range of specs and features to suit any application. From school and university coursework to music creation and graphic design, there’s a desktop PC for everything. 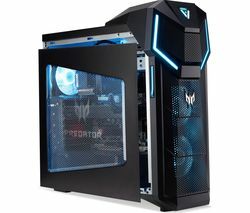 Gaming PCs have the performance and graphics capabilities to run the latest and most-loved PC games at their best. Whether you’re upgrading or looking for your first gaming PC, we have something you’ll love. Apple Macs run Apple’s own OS X operating system that gives an entirely unique look and feel. They are popular everywhere from professional studios to homes, and offer great performance and reliability. 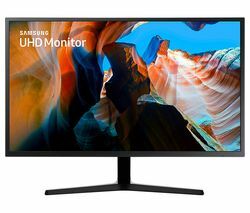 From everyday monitors for your work PC to incredible 4K monitors made for design and gaming, there’s a monitor to fit your setup. All modern monitors are capable of delivering HD images, so you can enjoy great-quality computing whatever size you choose. The operating system of your PC determines the way it looks, how it works, and the type of software you can use. The three main operating systems are Windows, Apple OS X, and Chrome OS. The processor is the brain of your PC and executes every command. Any software you buy gives a minimum set of requirements that the processor must meet or surpass. Our product pages give you all the info you need to find the right PC to run your programs. Often mistaken for storage, RAM (Random-access Memory) is where your PC picks up your requests and makes them happen. More RAM allows the processor to take on more jobs at once - ideal for multitasking. Your storage is the place where all your files (like documents, music, photos and software) go when you save them. There are two different types of storage for PCs – spacious hard disc drives (HDD) and super-fast solid-state drives (SSD). From a compact 19'' to a huge 34'', there’s an all-in-one to suit any use. Smaller all-in-ones are great space-savers and give you the functionality of a desktop PC without sacrificing the space needed for a tower. 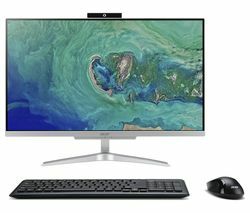 Larger all-in-ones are great for films, editing media and multitasking. Graphics card | A graphics card is a processor dedicated solely to handling the visuals your PC produces. Key for gaming. Hard disc drive (HDD) | The HDD is a standard hard drive - the type fitted in most desktops. Motherboard | The motherboard is a major component in your PC. 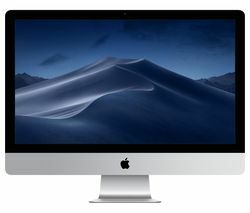 All other components connect to it, including the processor, RAM, storage and graphics. Solid-state drive (SSD) | SSDs give your PC improved performance, but have a lower storage capacity than HDDs. PCIe | PCIe stands for Peripheral Component Interconnect Express. PCIe ports are found inside desktop PCs and are used for adding graphics cards, sound cards and other internal components. Your PC is perfect for getting online and staying in touch with friends and family. Your PC needs to multitask for everything you do in a day. When it comes to your PC, you want the power to bring creative ideas to life. You like your gaming to go beyond the limits of your console. Whether you want a specialist PC for design and gaming or an all-rounder for your family, explore our range to find a PC with the perfect mixture of performance and price to suit you, your household and your budget. If you aren’t sure where to start, we have some handy tips on what to look out for when buying a new PC. Also, look out for ‘Our Experts Love’. 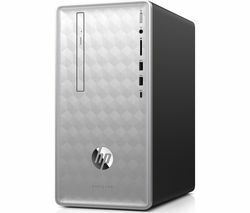 These desktops have been chosen by our experts because they come with the most exciting new features, and the latest technology.